10 Budapest: The best of! 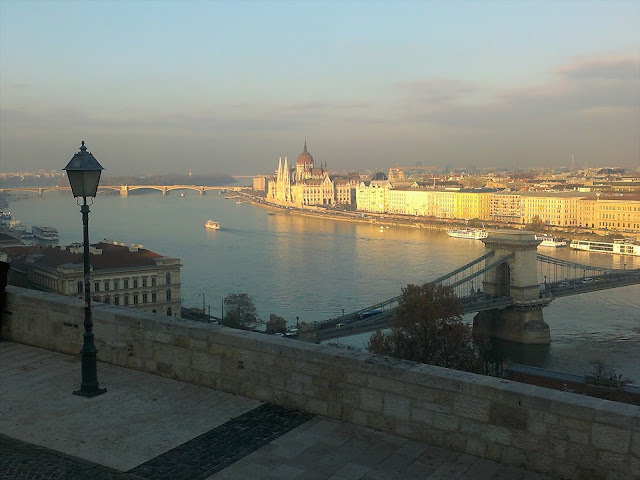 During my erasmus exchange program, I spent almost 5 months in Budapest. Altough I was every day in the university, I had time to enjoy a lot of things the capitol of Hungary offers. 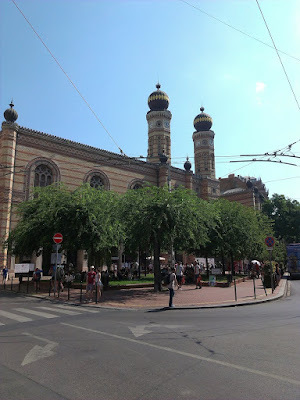 In this article I am going to mention my top 10 of Budapest. Of course it is my personal top 10 so it's not the overall best, but it can be an inspiration for you, if you plan to visit the beautiful city od Budapest. My favourite place in Budapest. I have been there at sunrise, sunset, in night and daytime. In my opinion, you have the best view from the place where the Liberty statue stands. There is a nice park on the hill with a lof of paths. On the top of the Gellért hill is a fortress called Citadela. If you are coming by tram, get of at the station "Szent Gellért". Gellert hill with the Liberty statue. The view from Gellert hill towards the south-east part of the city. Sziget means in hungarian island. It is actually a city park with lot of laisure options. You can bike there, run on a running path, watch the singing fountain or just lie on the grass. There is an open air bath too. Unfortunately, the fountain is opened only until october. During my stay in Budapest I have visited 3 baths. The Gellért baths, Rudás and Király. I liked Gellért because of it's luxurious historical atmosphere. Rudas has a modern wellness area with saunas, salt cave, hot water pools and more. You can even sit on the roof in a outside pool. Király is the cheapest option. It is the only bath with student discount. 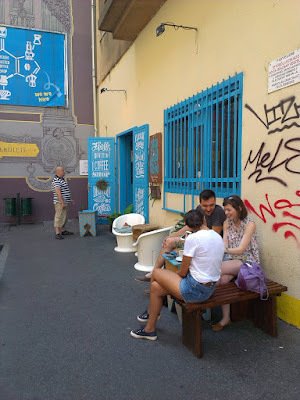 You can find so many types of Cafés in Budapest - the historical, modern or hipster ones. My favourite is café Konyha. 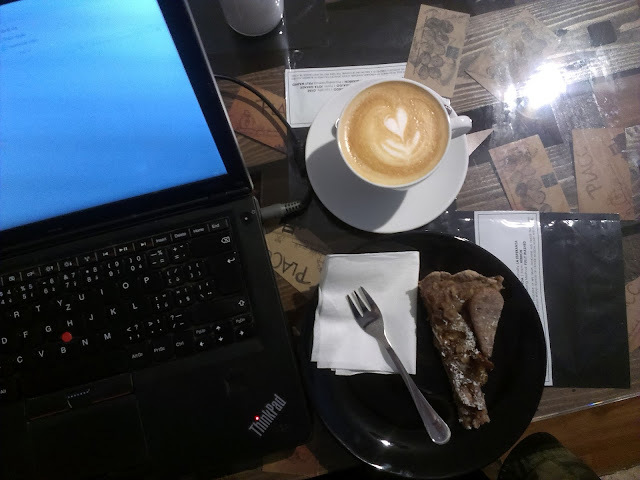 Close to my flat were three very good cafés: Placc (on the photo), Kelet and Hadik. I usually checked some cafés on foursquare and went there. Some of cafés recommended on foursquare, which I didn't manage to visit are Espresso embassy, Fekete or New York. Next time maybe. I was surprised by the wide range of kind of food selled in restaurant. Altough I am used to international food, in Budapest there is something new to me - the jewish approach. Next to the jewish restaurants you can find the eastern food in Hummus bars, kind of (healthy) fast food chain. I tryed the hungarian cousin too but I liked hummus and falafel more. Another great place for jewish food is Mazel Tov. For (cheap) hungarian food I recommend Fritzi Papa at Király utca. In one of the ruin pubs, probably the most famous one, Szimpla, there is sunday brunch and farmers market every sunday. 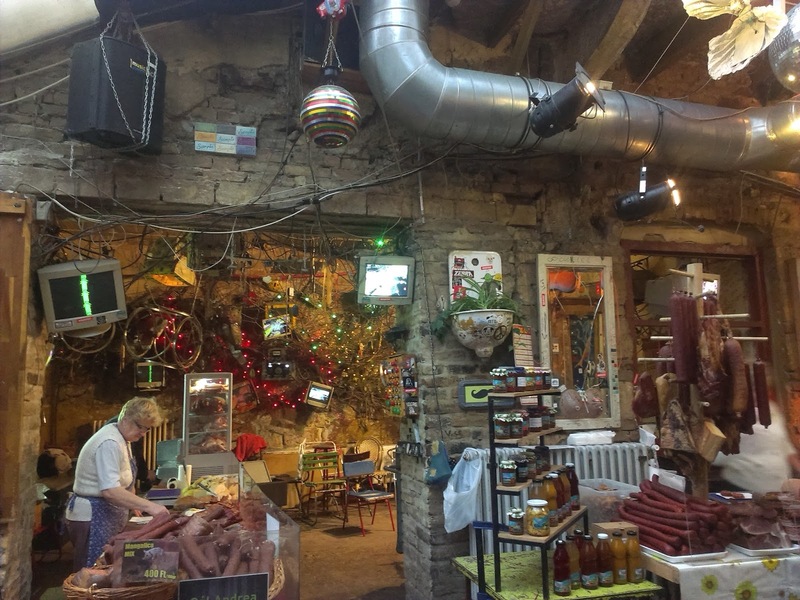 I highly recommend visiting this place, not only for the delicious local food but for the great atmosphere too. Traditional hungarian salami selled in not so traditional environment. Buda castle is the classic. It is a big area visibel from all over Budapest. It contains not only the castle itself, but the Matthias church, the Fish Bastei and a lot of another historical buildings to. The castle itself acommodates the National Gallery. I don't recommend going to a restaurant at Buda castle, since it's more expensive than in the downtown. Matthias church and the Fish Bastei. View from the castle towards the parliament. It is situated close to the centre of Pest. It begins with the old synagogue and goes on with jewish memorial in its garden, another synagogue and jewish cafés and restaurants. I like the atmosphere there and the feeling that every time you can discover something new there. It that district you can find the Kaziczy utca with a lot of interesting places. I like the green bridge (the Liberty bridge) the most. It is situated under the Gellért hill. All the bridges are worth to see and from every one of them you have a special view of the city. During the WW II the most of them were destroyed, however they were rebuilt soon after it. There are also a lot of legends and stories connected to the bridges. I lived in the 11th district, which is situated on the Buda side. It took me about 15 minutes to walk to the Great market hall. I was buying there fruit and vegetables at least one time a week and the offer was really big everytime. The selled goods is fresh every day and full of season products (as pumpkin, beet root, aubergines, apples etc.). There are several market halls situated in the centre of Budapest however the biggest and most famous one is the Great market hall situated at Fövám tér. It is not directly in Budapest, but easy to reach by train (about 2 hours and 20 minutes). It is the largest lake I have ever seen. I was surprised, that the whole lake is not really deep (you can swim up to 200 m towards the middle of the lake and still can reach the sand with your feet). The lake is full of sand as the beaches are too. I saw the most inredible sunsets there and enjoyed walking at the the lake. If you have any questions don't hasitate to ask in the comments or send me an e-mail. The Erzsebet look out is situated in the Buda hills which are easy to reach by bus from the Budapest centre. You have an amazing view towards the Danube river and the Budapest's centre. You can see even the parliament building. We had nice but cold weather on the day we decided to visit the look out and had a mulled wine and hot chocolate in the tower's café after we had enjoyed the view. Since the weather in Budapest is very sunny, it is very nice to spend december there. After the sunset the city starts to look really christmasy - the streets ar full of lights due to the trees wrapped in lights chains and the christmas markets stalls at every corner. This is the Christmas market at Vörösmarty square, right in the centre. There is a huge "food island" in the middle full of traditional hungarian food. Unfortunatelly, quite expensive (warm meel around 10 - 15 €). My fifth visit in Vienna contained of museums visits, christmas markets and good food/coffee. The christmas markets are on every corner in Vienna, so we managed to see many of them during our stay from friday afternoon to sunday night. For me the best ones were Spittelberg and Karlsplatz. They have really special atmosphere and you can meet many local people, not just tourist. The food we tryed was Raclette Bread, small sauseges in bun, pumpkin cake. Of course we did not miss drinks such as mulled wine, orange punch or hot chocolate. Great coffee in Cafe Latté art (Universitätsgasse). On saturday we visited mumok - the modern art gallery. There was an exhibition of work from Julius Koller, a czecho-slowak artist. His politicaly oriented work was unusual and inspiring. In mumok we visited the Cupcake café too. Of course we didnot miss some of the pearls od secession - Majolika house from Otto Wagner, The Secession Building from Joseph Maria Olbrich or The Karslplatz station from Otto Wagner. December 2016, two and half days trip with Kristý.